Speed Dating Rescue Horses- and Slaughter. “Hey, Little Red-haired Girl, I have your pony here!! !” Meet Bailey, my most recent date. If you follow my blog, you know I work with Ruby Ranch Horse Rescue. (RRHR.org) Rescue horses come to Infinity Farm- one at a time, for a 2 or 3 week stay. It’s a like speed dating! Two weeks isn’t enough time to train a horse. But it’s plenty of time to tune up a few tendencies and that’s a start. Horses show up with a laundry list of history and ‘problems’. The thing that amazes me the most is that those ‘problems’ aren’t any different from the ones faced by my other clients who own and love their horses. On one hand, the line between rescue horses and beloved partner/horses is non-existent, and conversely, it can seem like a separate universe. Yesterday Bailey went back to Ruby Ranch. I miss him already! 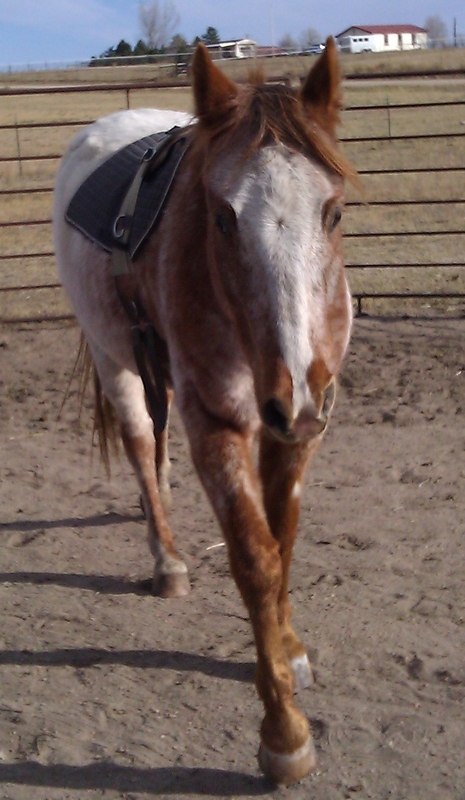 He has a hysterical sense of humor, if you speak Appaloosa. This year I’ve worked with seven horses from Ruby Ranch. They were all young and smart, strong and healthy. Just one thing wrong, if you ask them. Two of the seven have found homes, thanks to the good work of the rescue. Pat and Roger get the credit for that- rescue work is challenging in a dozen ways and happy endings are reason to celebrate. Horses always give more than they get, especially rescue horses. Stories- like this one About a little boy and his Peanut Butter -are so common they are almost cliché. And just this week, a bill was signed in Washington to open U.S. slaughterhouses again. (Read about it.) Horse meat will be available for your dining pleasure. I can rant about responsibility and inhuman methods- slaughtering is a terrifying and painful end for any horse. No one debates that. The word slaughter has a second meaning as well: an overwhelming defeat. Like the moral loss we all suffer while the killing continues. “The greatness of a nation and its moral progress can be judged by the way its animals are treated…”– Mahatma Gandhi. I can rage, I can rant- but barely below my surface is sadness even darker. We are barbarians. The majority of the world has outlawed capital punishment, but not the U.S. Since we are willing to kill our own species- slaughter of horses, dogs and cats are perhaps not our biggest moral problem. AND I’m continuing Thanksgiving this season- so let me say I am grateful for my ‘useless’ horses. Over half my herd is un-rideable; they serve as therapists and photo models for my blog. Their lives matter. Finally, I am always and forever grateful to belong to a civilized and moral community. I am going out to the barn to be with them now. We should be supporting great organizations like Ruby Ranch year-round, as you do, not only at the holidays – “A rescue horse isn’t only for Christmas”. Thank you for the reminder that at this time of year, when hopefully the holiday spirit makes us feel like helping, there are such worthy organizations needing our help. The horses from Ruby Ranch that I’ve met at Infinity Farm are beautiful horses that would be a joy to own, let’s help them find forever homes. The pro-slaughter AQHA registers 85,000 foals every year, most of the horses sent to slaughter are between 3 and seven years old. PLEASE call them out on their treatment of fine animals as disposable objects! That spotlight alone will change the horse rescue/slaughter scene.